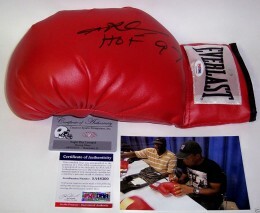 Sugar Ray Leonard cards and autograph memorabilia hold a special place in the hearts and minds of many of his fans. Leonard's career provides a nostalgic reminder of the sport long before the Pay-Per-View era. Leonard's classic fights could be seen for free, with many a father and son could watching on broadcast TV, on a Saturday afternoon. Leonard's in-ring success and outgoing personality helped garner commercial appeal for the sport as well. 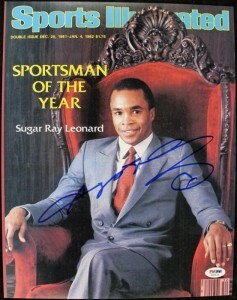 As a result, Sugar Ray Leonard became a household name during the early 1980s. Sugar Ray Leonard is one of the few high-profile athletes that collectors have a legitimate opportunity to collect in their entirety. Leonard's catalog of trading cards only consists of well under 50 items. His first nationally distributed card was a food issue as part of his endorsement deal with 7-Up. 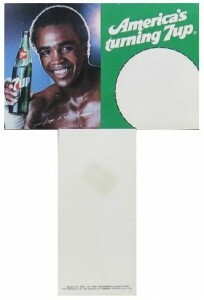 Back when soda still came in eight-packs of glass bottles, Leonard had an over-sized card attached as a stand up in the carton. He was also included in 1981 Panini Sport Superstars, a sticker set released in Europe. Leonard's first traditional pack-issue cards wouldn't be released until 1991 when three companies, AW Sports, Impel and Kayo, all released products with Leonard on the checklist. 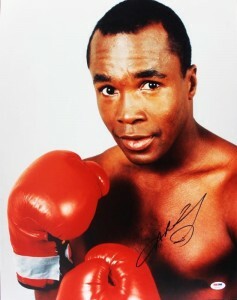 Far more popular than his trading cards, Sugar Ray Leonard autographed memorabilia is always in strong demand. He frequently appears at larger autograph signing events and is relatively affordable. 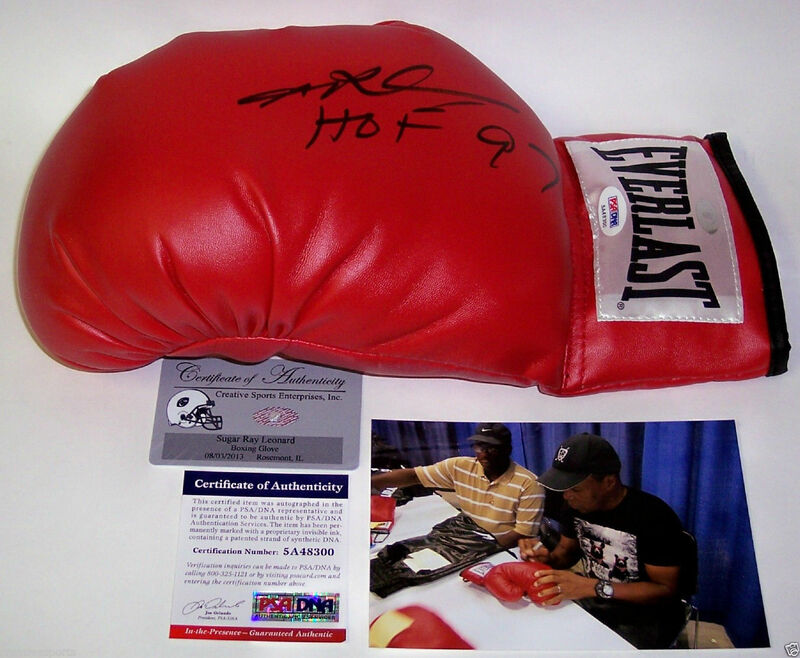 Popular item to have signed include Everlast boxing gloves, vintage photographs and commercial advertisements. A classic image of a young Sugar Ray Leonard proudly endorsing his title sponsor, 7-Up. Frequently used in the company's advertising campaigns, this is the first "trading card" on which Leonard appeared. 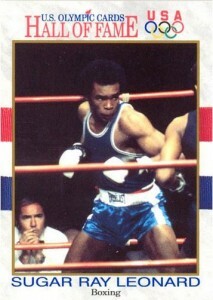 Although a sticker and not a traditional trading card, the 1981 Panini Sports Superstars Sugar Ray Leonard is a popular choice with boxing card collectors. As an international issue, it's relative tough to find but not impossible. Showcasing a now older, Sugar Ray, winding up to deliver a vicious right, the detailed biographical write-up on the back of the card explains why he was named the "Boxer of the Decade" for the 1980s. This multi-sport set produced by Impel in 1991, pays tribute to great American Olympians. 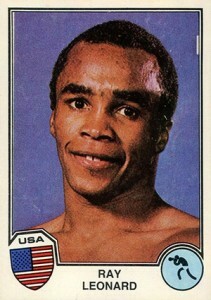 Sugar Ray Leonard won the Gold medal at the 1976 Summer Games in Montreal, fighting in the light welterweight division. This card pays tribute to that historic achievement. 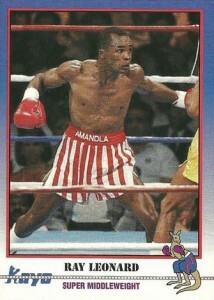 Sugar Ray has a total of three cards within the 1991 Kayo set. Two showcase him individually. 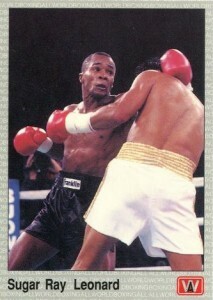 The third, card #37, depicts Leonard in one of his epic bouts with longtime rival Roberto Duran. 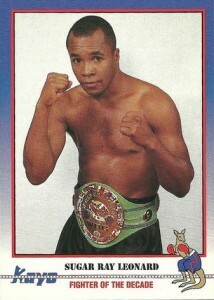 1991 Kayo Boxing Sugar Ray Leonard #2 Prototype Trading Card Very Rare!! 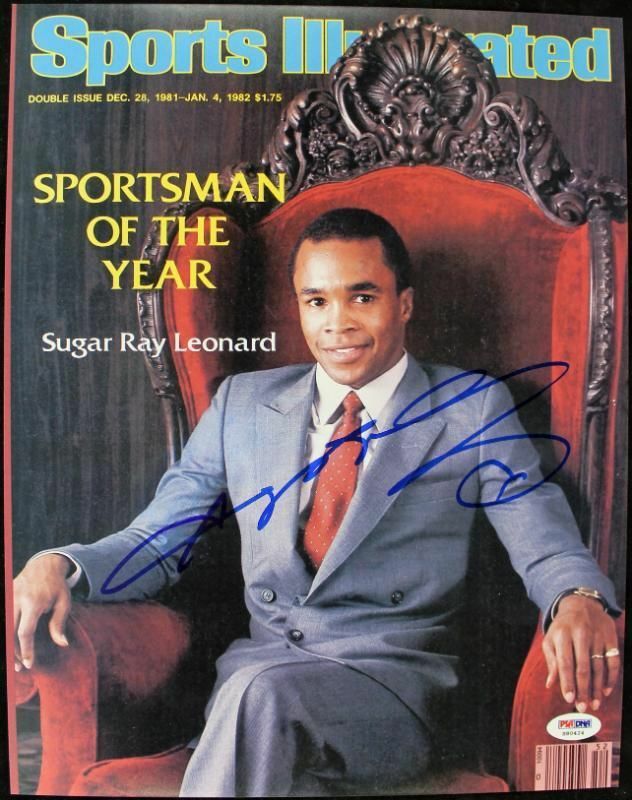 Below you will find an example of what Sugar Ray Leonard's authentic signature looks like. This can be used as a first point of reference for determining the legitimacy of autograph memorabilia, but is not a substitute for having your items authenticated by a well-respected professional autograph authentication company. Some of the trusted sources within the sports memorabilia market include the following companies: PSA, JSA, Tristar and Mounted Memories. The signature exhibits an overall consistency that flows, with several starts and stops. The entire signature is hastily written with few discernible letters. 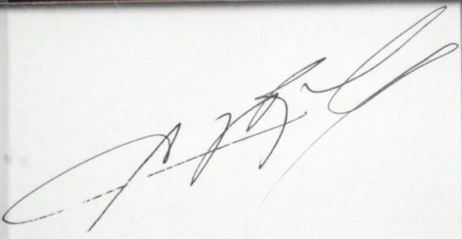 The letter start of the signature includes a swooping line forming an oval back and to the left, the line extends well into the next set of characters. The next character resembles many things but not an "R", look for what could be mistakenly the start of a letter "M" drawn in a manner that it ends up looking like an "A." The last characters look like two connected lower-case, cursive "l";s lying on their side at an angle.